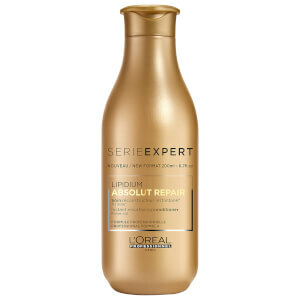 Revitalize and strengthen damaged hair with the L'Oréal Professionnel Absolut Repair Lipidium Reconstructing Shampoo. Specifically formulated for dehydrated, brittle and extremely damaged hair, the luxurious shampoo utilizes Lipidium Technology to help repair the hair cortex from within, containing a powerhouse blend of Lactic Acid, Phyto-Keratin, Ceramides and Lipids to combat breakage and lock in essential nutrients. Suitable for daily use, the advanced shampoo leaves hair feeling clean, silky smooth and nourished with a healthy-looking luster. Distribute evenly through wet hair and lather. Rinse thoroughly. Repeat process if necessary. 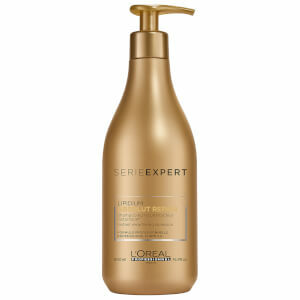 Follow with Série Expert Absolut Repair Lipidium Resurfacing Conditioner or Instant Reconstructing Masque.